Minnesota public cemetery associations have two statutory procedures which may be used for recovering abandoned Minnesota cemetery lots. for as much money as it is worth he shall give it me for a possession of a burying place amongst you. M.S. Section 306.21, Subd. 1(b) identifies the requirements for the recovery of legal title to abandoned cemetery lots in a quiet title judicial action. conveyed such lots and parcels by deeds of conveyance – with or without restrictions. during that time, has not provided to the public cemetery association or private cemetery a written notice of claim or interest in such cemetery lot or lots. has not provided to the public cemetery association or private cemetery the required notice of claim or interest in the cemetery lot or lots. furnish a place for the propagation of growth of weeds and brush. supported by satisfactory evidence of the interest. an affidavit or other testimony evidencing that the Owner has failed to satisfy the above requirements. In order to proceed with a quiet title judicial action, M.S. 306.21, Subd. 1(a) identifies that the resolution of the governing board of the public cemetery association or private cemetery must be served upon the Owner in the same manner as a complaint in a civil action. an Affidavit of Publication identifying that the public cemetery association or private cemetery has satisfied such publication requirements must be filed with the court. the cemetery lot or lots restored to the public cemetery association or private cemetery corporation, free of any right, title, or interest of the Owner, and any heirs or assigns. together with sufficient ground to provide a proper approach to such cemetery lot or lots. Any such excepted cemetery lot or lots or access parcels must be “particularly and fully described” – which may require the services of a licensed surveyor. M.S. Section 306.21, Subd. 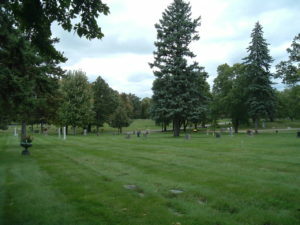 2 identifies an alternate procedure with respect to the recovery of legal title to abandoned cemetery lots in a quiet title judicial action when the Minnesota cemetery lots were sold before 1925.
demand that the owners or holders of the lots pay the association the fees owed for care and upkeep in the period during which the fees were not paid. The resolution must state the amount of fees due for each lot, without interest, and declare that if that amount is not paid to the association by the persons claiming to be owners within 90 days that the described lots and all interest in them will be considered abandoned to the association. The resolution must name all of the persons shown by the records of the association to have a claim of ownership to the lots described and must be served in the manner required for service of a resolution by subdivision 1. Upon the achievement of proper service, the public cemetery association or private cemetery corporation may proceed with the quiet title judicial action. M.S. Section 306.22 identifies that the required quiet title judicial action under that provision is generally the same in all respects as it is in ordinary actions to determine title to real estate. failed to keep the cemetery lot or lots, or parts thereof, clear of weeds or brush. has not – during the permitted period of time – given the required notice of claim or interest in the cemetery lot or lots to the public cemetery association or private cemetery. M.S. Section 306.24 identifies that a certified copy of any judgment obtained in a quiet title judicial action may be recorded in the office of the County recorder in the county in which the cemetery lot or lots are located. However, unless the original conveyance of the cemetery lot was recorded in the office of the County recorder in the county in which the cemetery lot or lots is located, recording a certified copy of any judgment obtained in the quiet title judicial action may not provide any practical benefit to the prevailing public cemetery association or private cemetery – other than to preserve in the public record evidence of satisfaction of the requirements for recovery of the cemetery lot. Please contact Gary C. Dahle – Attorney at Law, for assistance with the recovery of any abandoned Minnesota cemetery lots – quiet title judicial action.